City Council meetings are the 1st Tuesday of each month at 7:00 pm. 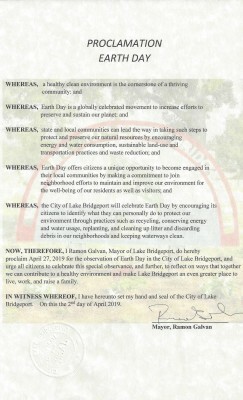 April 27th as a day of observation for Earth Day in the City of Lake Bridgport. Please join us on the 20th at 10am for lots of fun and free hot dogs and prizes! BEFORE YOU BUILD YOU NEED TO CALL! RULES ON BUILDING HAVE CHANGE! RV living is not allowed inside the City Limits of Lake Bridgeport. We will be enforcing this rule/ordinance. You will be given notice and 30 days to remove from the city or to unhook your RV. Violators can be fined up to $1000 dollars. Before you build or fence ask first about permits needed. Citations will be issued to those, not in compliance with the ordinances. City Hall is not allowed. Please help us to keep the City of Lake Bridgeport safe. Report any unusual activity to the Wise Co. Sheriff's department. If you need to speak to someone in our office concerning a violation please contact the office.